Let me take you on a walk. We'll just hop into the car for a few minutes, driving in what seems like the wrong direction just to get over the creek and the railway line, past Wollstonecraft station and then down Shirley Road lurching steeply downwards, suddenly reaching a dead end and thus arriving at the entrance to Berry Island. There is a neat, green sign telling you where you are in case of confusion. 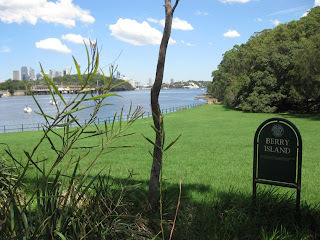 To the left, over the sea, you can see Ball's Head Reserve and beyond that, the Sydney skyline. The Harbour Bridge peeps out behind Ball's Head Reserve far to the left. You will have to wait a while before we head off on our gentle amble (this walk won't overly tax you by the way) so that Sniff can tear around the grassy area in front of us, sniffing at and peeing on every prominent tussock and stalk before choosing the perfect spot in which to roll around on his back with all four paws in the air. Once he has once more mastered the green we can set off. Hopefully the sun is out but not too fiercely. Hopefully it's not raining. But more than likely it is either too wet or too hot and we just have to deal with it, juggling with the sun cream, insect repellent, umbrella and water bowl for Sniff in our bags. 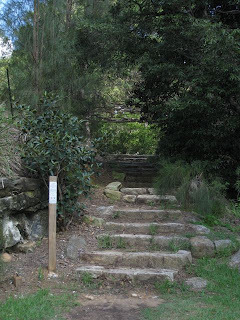 Much of our walk will be shaded and it's neither steep nor difficult so you can relax...honestly. We watch the ants crawling up the steps in steady streams and contemplate once more just how many ants there might be in the world before plunging on into the trees ahead. Suddenly, it's like Picnic At Hanging Rock. We're in the bush. 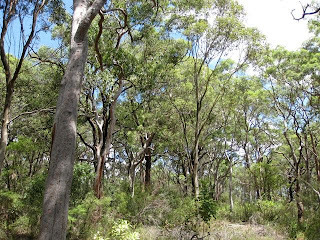 Cicadas fill the air with their whirring sound, the light filters sharply down through the eucalypts, panpipes start playing and your muslin dress floats behind you in the desultory breeze. There's no time to contemplate this phenomenon though as Sniff is charging ahead towards the aboriginal carving of a giant fish eating a stingray. 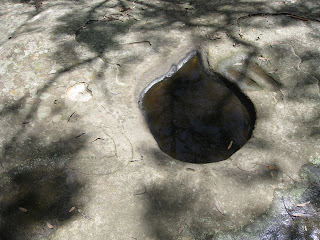 The fish is too large to capture in one photograph but you can see some grooves in the stone to the left of the watering hole, which were created over time by the sharpening of tools. There also seems to be a carved boomerang shape to the left of the water. The faint outline of the fish extends across a much larger surface of stone, perched here with a great view down to the sea, where, now, industry has taken its toll on this particular piece of coastline. 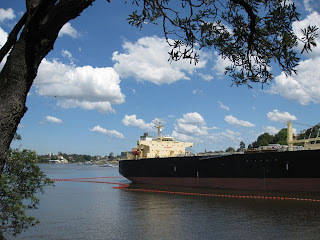 There seems to be some gasworks and several industrial-looking ships espied down there through the trees and, a few hundred metres on, we come across this monstrosity. It's the sort of ship that makes you wonder whether or not you are going to be arrested when taking photographs of it...It's definitely on a secret mission, hidden here behind Berry Island, invisible to the bustling city beyond. Thoughts of spies and wars and bombs crowding your mind, we look round for Sniff and realise he's trotting ahead along the path towards the headpoint of the island where we can sit and contemplate the city skyline ahead of us and the iconic Harbour Bridge through the trees to the right. If you fancy, you could clamber down the rocks to the sea and indulge in some illegal fishing whilst I have a little snooze. 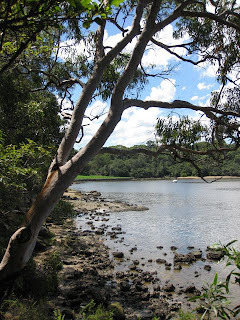 Depending on the tide, we now have the choice of either continuing around the path through the trees, listening to the occasional kookaburra calling whilst scaring lizards into hiding, or of descending down to the sea and continuing around the shoreline, clambering over rocks and scaring strange-looking beetles into hiding. Either way we're going to scare something. 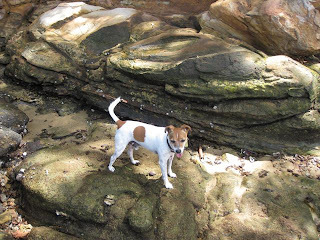 As Sniff loves the smells of the shoreline we'll opt for the sea. 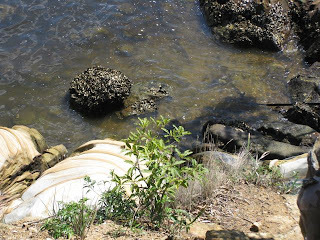 As we climb over the rocks you notice all the broken oyster shells and the limpets suckered on to every surface. We ponder the possibility of bringing a knife and trying to pry some of the whole oysters off for tea. There is a loud voice calling through a megaphone and we briefly wonder if someone has spotted that Sniff isn't on a lead and that we're about to be fined. It turns out to be hailing from a military-looking boat moored over the sea by Balls Head Reserve and once more our minds fill with thoughts of conspiracies and covert operations. Sniff bounds along happily back towards the green ahead in order to chase some odd-looking birds. "What are they?" you ask me. 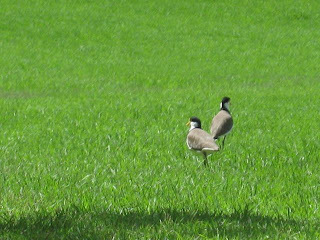 "Masked Lapwings" I knowledgeably reply. "So-called because of their flappy yellow dewlaps..." You then remark upon how green the grass is just as the rain begins to fall, eager to make it even greener. might Australia finallly be wreaking her charms on you???? Really, the only difference as far as I can tell between Sydney and the west of Ireland is the temperature of the rain. 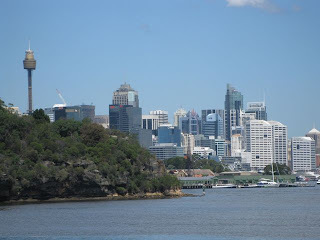 you love Sydney you do! It's your boyfriend! You love love love it!